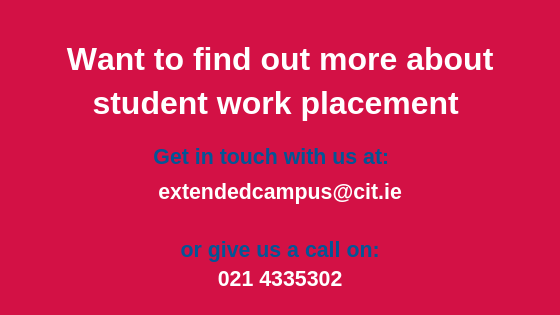 With more employers requiring experience as well as academic success, work placement is a highly valued component of the student experience. CIT considers it to be a key element in the professional development of students, refining their skills in a real-world context. This commitment to student development means that each year approximately 2000 students, from a broad range of disciplines, are placed in organisations across Munster and beyond. Work placement gives students the opportunity to gain an insight in to the working world they will be entering and the opportunity to put all that academic theory in to practice. It also offers the company the opportunity to obtain a skilled student for the duration of the placement and establishes new recruitment possibilities. There are work placement opportunities in a range of disciplines at Level 7, Level 8 and Level 9 and the placement module can last from 15 weeks to 9 months. 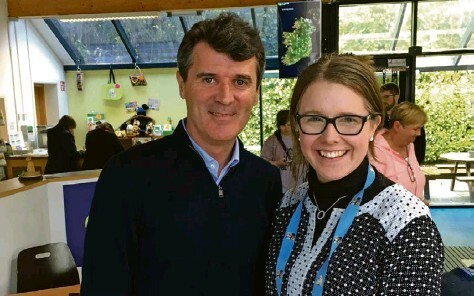 In February 2018, Alison Desmond (Pictured below meeting Roy Keane, long-time supporter of the charity) a student from CIT, joined Irish Guide Dogs as part of her placement in Year 3 of her course. Alison’s role was Marketing and Corporate Assistant where she supported both the marketing and corporate teams. Evelyn Power, from Irish Guide Dogs for the Blind said, “From day one, Alison was passionate, professional, eager and open to learn. She quickly picked up on the way of working within the charity and developed relationships with all of the team, supporting a wide range of different events and activities. "We couldn’t have found a better fit for the whole team with Alison. We found the CIT placement process great. It was a simple and easy process, with extremely positive benefits for the whole charity,” Ms Power added. Work placement recruitment begins in September/October every year. We advise employers to let us know of their placement requirements as soon as they can.